A Duncanville ninth grader seriously injured in a domestic violence shooting has returned to class. Storm Malone attends high school through his proxy robot. 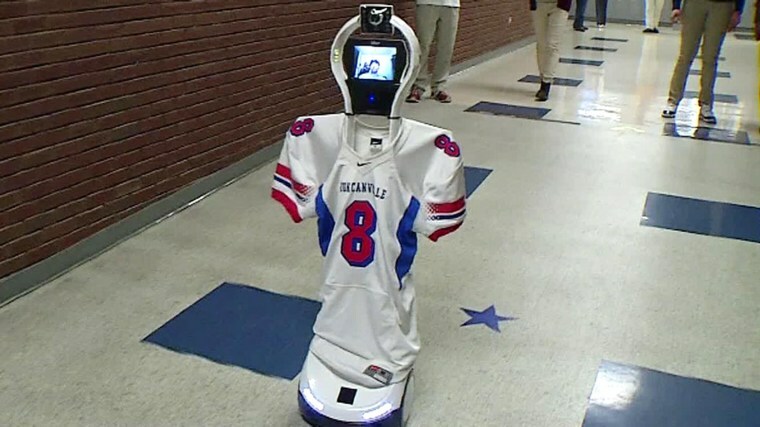 The Storm Bot, as it's called, wears Storm's number 8 football jersey and his face appears on the screen. He can hear his teacher and classmates, and even get the teacher's attention by flashing a light on the robot's forehead. Storm has not physically been in class since he was shot last August. The attack killed four people, including his mother and sister. Since then, he's been recovering. Storm uses a wheelchair, and keeps up with his studies at home. But he is happy to be back in class, even if it’s through a screen, and for only an hour a day. "I'm just really glad to have this opportunity,” Storm said. Storm can guide the robot remotely through the halls. The technology is bringing him back to his friends, who say it doesn't feel strange at all. "It already felt good just to see him at home doing better,” said classmate Kamaria Davis. “So, to see him at school is still a big step and it's amazing."